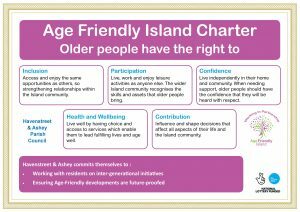 Lottery through the BIG Lottery fund making the Isle of Wight a truly great place to grow old, while also tackling social isolation. The partnership includes organisations committed to building an island that values, respects, and actively supports older people, with the voice of older residents at the heart. Encouraging older adults to take a more active role in their communities, and enabling their voices to be heard by services and organisations across the island. 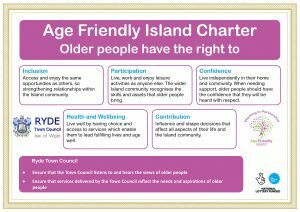 As part of this exciting initiative the Isle of Wight will become the first rural UK area to join the World Health Organisations (WHO) Global Network of Age Friendly Cities and Communities. With funding from the BIG Lottery Fund the Age Friendly effort is starting with a focus on adults aged 50+, by running 12 different and innovative projects across the Isle of Wight. 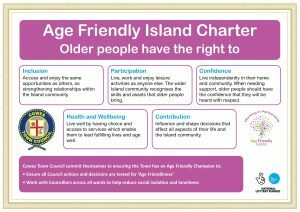 The following Island Town and Parish Councils have signed- up to Age Friendly Island’s Charter. 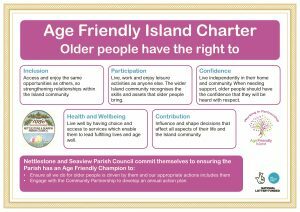 With the population of the Island growing older the Charter demonstrates Town and Parish Councils commitment to supporting older people and to help make the Isle of Wight a great place to grow old. Other organisations based at the Riverside have also signed up for the Charter including Community Action Isle of Wight and The Footprint Trust.